Mövenpick Resort & Spa Jimbaran Bali has been named as Bali’s Leading Family Resort at the 2018 World Travel Awards Asia & Australasia, which are recognized globally as a hallmark of industry excellence. The family lifestyle resort, which is located just five minutes’ walk from the beach, received the honor in a glittering Gala Award Ceremony held in Hong Kong on 3 September 2018. Mövenpick Resort & Spa Jimbaran Bali was selected ahead of 11 other leading Balinese resorts for this prestigious award, including many top global brands. 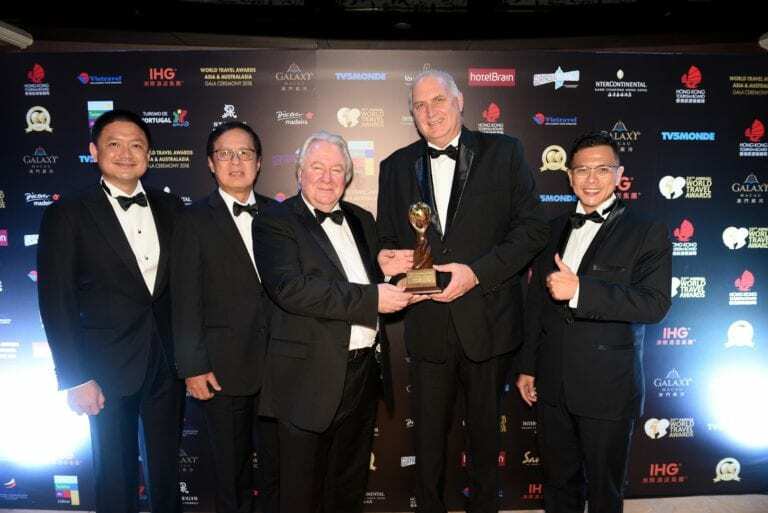 The award was presented to Mr Horst Walther-Jones, General Manager of the Mövenpick Resort & Spa Jimbaran Bali, and Mr Soegi Nagaria, Director of Summarecon Agung Tbk, owner of the property. “It is a great honour to be named as Bali’s Leading Family Resort at the 2018 World Travel Awards. This exquisite island is one of the world’s most competitive destinations for hotels and resorts, with many excellent properties catering for families. So to be judged as the best in Bali is a truly fantastic achievement. I would like to dedicate this award to my entire team, who work tirelessly each day to create the best possible experiences for our guests,” said Mr Walther-Jones. “When we designed this beautiful resort we wanted to make it the ultimate destination for families, while also showcasing Balinese culture to the world. We are delighted therefore to win this award; it shows us that we have succeeded in creating a truly special resort where different generations can come together and experience the best that Bali has to offer, in terms of accommodation, activities, cuisine and cultural heritage,” said Mr Soegi Nagaria. Mövenpick Resort & Spa Jimbaran Bali is an ideal destination for families, with several expansive swimming pools, a manmade beach, swim-up hammocks and a children’s pools with water slides, plus the pirate-themed Meera Kid’s Club which features an indoor playground with trampoline and ball pit. Meanwhile, parents can unwind at the Arkipela Spa & Wellness. Families can also stay and play together; a collection of spacious Family Rooms feature separate bedrooms for parents and children, while the unique Family Programme offers a series of fun activities including Balinese cooking classes, local dance lessons, jewellery making and more. Finally, the Anarasa restaurant offers a dedicated children’s dining zone. The World Travel Awards celebrates its 25th anniversary year in 2018 and its annual programme is renowned as the most prestigious and comprehensive in the global travel, tourism and hospitality sectors. The black-tie Gala Award Ceremony in Hong Kong was attended by the industry’s key leaders and decision-makers, as well as trade and consumer media. The winners of the 2018 World Travel Awards Asia & Australasia were selected based on voting by verified travel professionals during the period 1 April to 31 July 2018. Designed as a family lifestyle resort, Mövenpick Resort & Spa Jimbaran Bali features 297 elegantly furnished rooms and suites and invites guests to immerse themselves in Bali’s laidback island lifestyle, vibrant culinary scene and rejuvenating wellness offerings just 100 metres from Jimbaran Beach. Along with five different dining venues offering a varied selection of cuisines, the resort also boasts an exotic pool with swim-up hammocks, pirate-themed Meera Kids Club, invigorating Arkipela Spa and the connected Samasta Lifestyle Village for additional shopping, wining and dining. Mövenpick Resort& Spa Jimbaran Bali and Samasta Lifestyle Village are owned by respected Indonesian developer, PT SummareconAgungTbk. For more information, please visit www.movenpick.com/jimbaran-bali. Mövenpick Hotels & Resorts is a modern, international upscale hotel management firm with a “we make moments” business philosophy, recognising that small gestures make a big difference to its guests, business partners and its workforce of more than 16,000 team members. The company manages more than 82 hotels, resorts and Nile cruisers across Africa, Asia, Europe and the Middle East and is on track to meet its target of operating 125 properties by 2020. Headquartered in Baar, Switzerland, Mövenpick Hotels & Resorts’ values reflect its Swiss roots and rich culinary heritage and it is passionate about delivering gastronomic excellence and intuitive service – all with a personal touch. Committed to sustainable practices and caring for local communities in the destinations where it operates, Mövenpick is the most Green Globe certified hotel company in the world. For more information, please visitwww.movenpick.com.